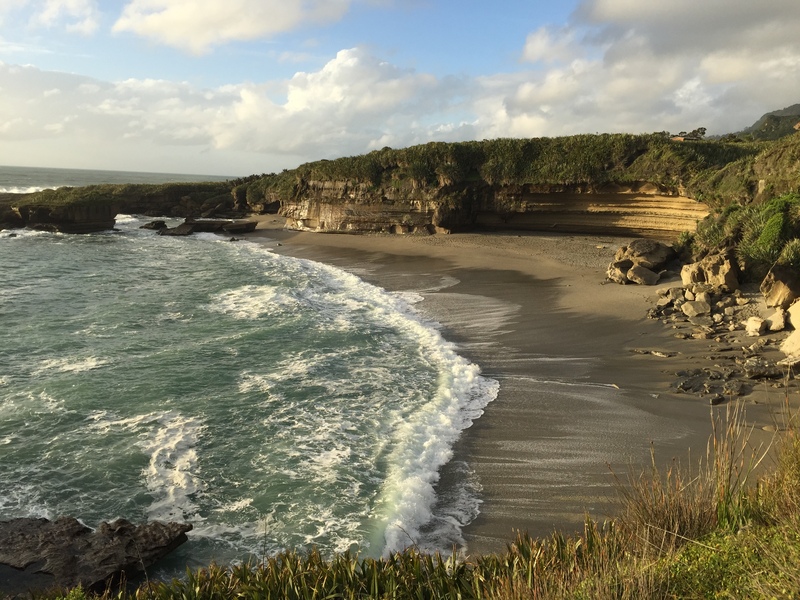 Punakaiki on the wild West Coast of New Zealand’s South Island is a well known tourist stop. Famous for its pancake rock formations, and that is where most people pause for a 20 minute look and carry on. But if you stop and stay a while, you will find that this area has much more to offer those who are prepared to explore a little further afield. ANZAC weekend had the added bonus of being ‘Mondayised’ this year, and being unable to resist the adventure opportunity of a long weekend, we packed up the car full to the brim with kids, paddle boards, food, wine and gear and joined our friends James and Elisa at Manaia Roa holiday house. This old roadman’s hut has a prime position on the Pororari River and Bullock Creek lagoons, overlooking the ‘Boot’ rock. We arrived in the dark and left again before sunrise the following morning to attend the 100th ANZAC day commemorations in Greymouth. 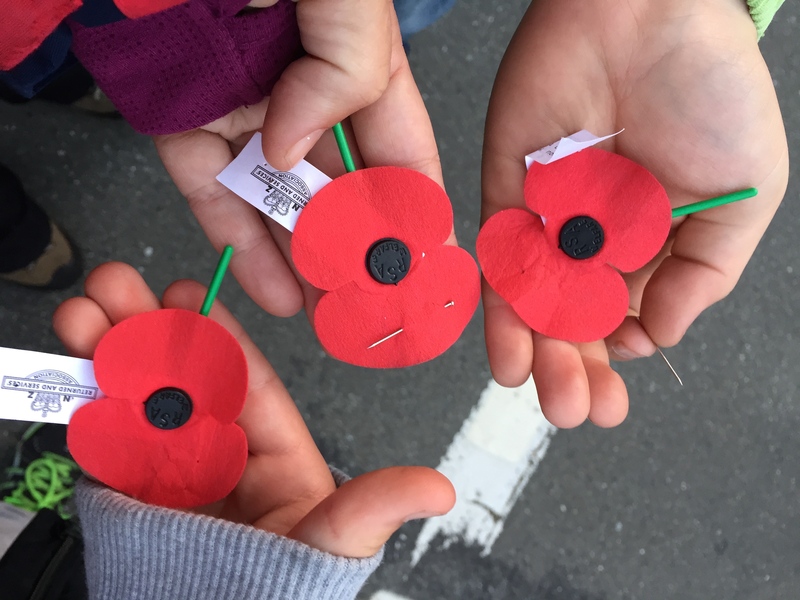 The kids clutched their poppies, and we listened solemnly to the service, sang the National Anthem and swallowed the lump in our throats as the Last Post was played. A huge crowd had gathered at the cenotaph to pay their respects to the fallen soldiers who have protected our country and paid the ultimate price for the freedom we all enjoy today. When we arrived back at the little bach we were very impressed with the commanding view and waterfront location. The kids immediately disappeared to play frisbee on the beach and explore the lagoon while we cooked up a big breakfast and admired the outlook. This little slice of paradise has been owned by one family for many years. Anne Inwood is the current owner, but before her it belonged to her grandma, Ethel Truman. The bay next door is called Truman’s Bay and the track to the beach was made by Anne’s uncle Jim Truman. We had brought our inflatable dinghy and paddle boards over to explore a nearby river, but with one so close to our doorstep we couldn’t resist the opportunity to get wet. However the tide was low, and so was the river, and the dinghy and outboard wouldn’t have made it terribly far. Luckily just up the road is a little kayak hire place, and so we pumped up the SUP’s and hired some kayaks for the kids and James & Elisa and headed off for some adventures upstream. The river runs slow and the tea colour is caused by the peat in the ground it runs over. But despite the colour the water was clear and shadows of trees deep beneath loomed below. Every now and then the river shallowed and ran faster over small rapids. We jumped off the boards and dipped our toes in to the freezing cold water, half running, half hopping until our feet became numb. We dragged the kayaks and carried the SUPs up the rapid and then continued on. SUP’s aren’t really designed for paddling upstream. At one stage I hit the bottom and just about catapulted myself over the front of the board and Andrew fell off attempting to paddle up a rapid, but it was a great challenge all the same. The others were having a ball in their kayaks. We stopped for a quick snack and then carried on further until we reached a slightly larger rapid. The kids were keen to give it a go, so they got out and dragged their kayaks up the shingle bank to one side and then entered the stream again above the rapid. We were all feeling a bit more confident with reading rivers having recently completed a three day journey on the Whanganui River. Aiming for the V, they paddled frantically towards the rushing white water. Will first and then Seth. The smiles on their faces were from ear to ear. Paddling downstream was much more fun until a strong headwind blew up the river, making headway almost impossible. We knelt down to reduce our windage and managed to eventually make our way back to the canoe hire place. Unable to resist the temptation to explore further, we headed out in to the lagoon and down the river towards the ocean and the bach we were staying at. Bullock Creek is right next to the bach. The smooth rock walls have been carved out by this river. Today it was quiet and tranquil, but the next day, after 24 hours of solid rain, this creek became a raging torrent of water reaching high up the walls. Reluctantly we returned the kayaks, promising to come back and pay, having all forgotten to bring any money with us to the river! Along the main road, a small sign indicating the entrance to a cavern is easy to miss, but finding a parking spot further down the hill, we crossed over the road and headed down the steps clutching our torches. The dark cave had rocky boulders covering the floor, and so we clambered over them to penetrate deeper inside. Shining our torches on the rocks above, the kids admired the small stalactites forming above. We went further and further inside, squeezing through a narrow gap to get to a wider area, before we could go no further. We all turned off our torches to see just how dark it was. Black. Your eyes never adjust to this kind of darkness. The kids weren’t spooked though, and they scrambled back out the way we had come. The tide was coming in now, and with an onshore wind the waves were smashing violently on to the rocks below the road. This is what makes the West Coast so dramatically spectacular. The forecast for the following day was average, but dressing up in our wet weather gear, we jumped in the car and headed up the shingle track to the start of the walk to the Cave Creek Resurgence. The kids skipped on ahead as we walked through the lush West Coast rain forest. We had all read in the newspaper about the 20th anniversary of the Cave Creek tragedy. Back in 1995, 18 students were standing on a viewing platform, looking out over a steep precipice when it collapsed, sending them all falling down to the rocks below and killing 14 people. The article said that the engineer who designed the platform had no experience of designing such structures, however that wasn’t a factor as the platform wasn’t built to his specifications anyway. There was also supposed to be a sign indicating a maximum of five people permitted – but this was never erected. It seemed a terrible tragedy for these adventure tourism students to be killed doing something that should be so safe. The Cave Creek Resurgence is a deep crack in the hillside where the creek emerges from the depths of the mountains above. It is a magical place with its tragic history. As we walked back, it began to rain. Very wet, West Coast rain, and even though we were well dressed, we were all completely soaked by the time we made it back to the car, and we spent the afternoon playing scrabble and backgammon. It rained solidly all night, and the lagoon out the front had changed from a small river to a wide swiftly moving body of brown water. The waves by the boot rock were breaking brown on the bar. But the sun was out! 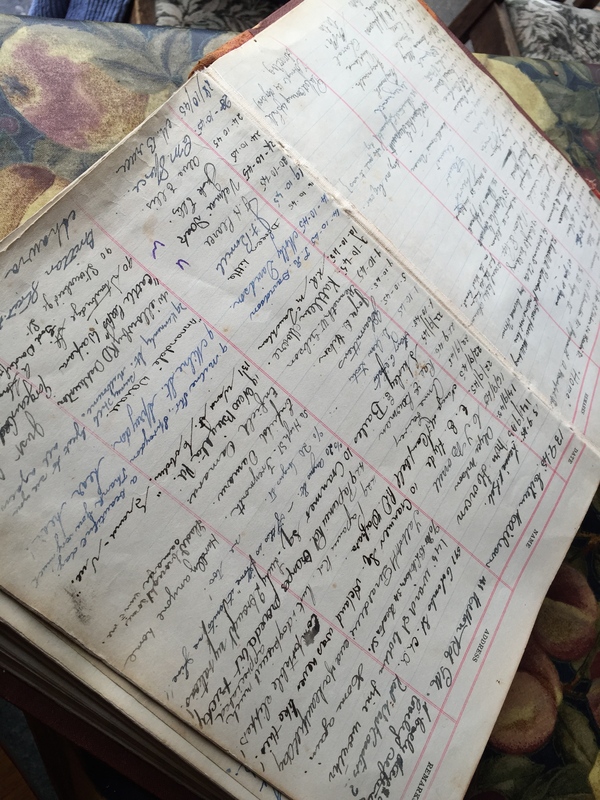 The bach had an amazing visitors book dating back to 1945. I spent a long while flicking through the pages, and found a hand scrawled map and some notes alluding to a secret beach that can only be accessed via an unmarked track and through a cave! This sounded right up our adventurous alley. So we set off down Trumans Track to see if we could find it. Truman’s Track is rated as one of the best short tracks in New Zealand. It is easy to see why as we wound our way through lush native bush and eventually out through the flax to view the stunning beach below. The wild foaming waves roar up the beach and quickly sweep back. 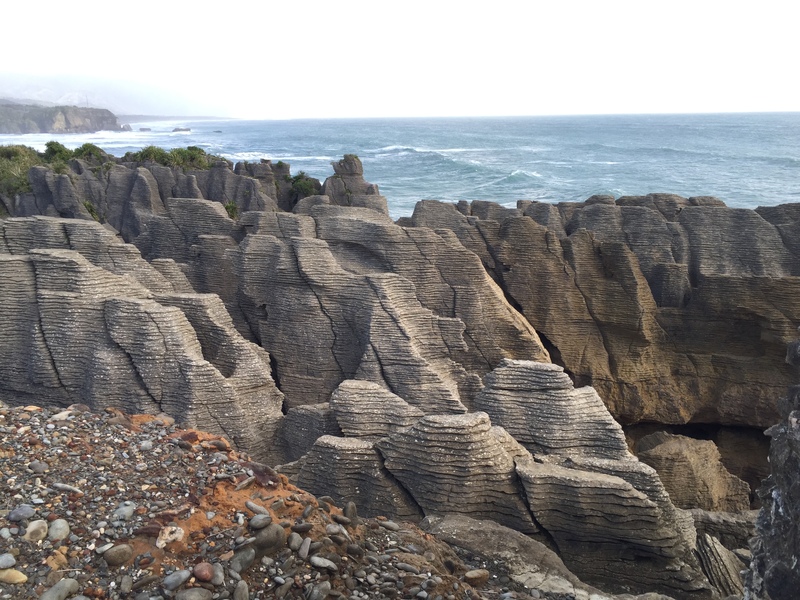 The cliffs behind have been carved in to amazing formations, exposing ancient shell fossils, millions of tiny round stones gleamed like jewels under our feet, and the kids fossicked for greenstone. A waterfall emerged from a cave above and splashed on to the rocks below. We carried on to the far side of the beach, and following the instructions we scrambled up a very slippery cliff and edged our way along a narrow ledge until we came to a pile of boulders. Pulling each other up and over each slimy boulder and then along a muddy track we came to a pool and a cave beyond. There was light shining from the other side, and so as we climbed through the gap we emerged out in to a huge cave and another beach! It began to rain again and this stymied any possibility of further exploration as the cliffs were super slippery. Three of us had already fallen over, and so we reluctantly headed back to the bach to clean up, pack up and head home. Another wonderful weekend exploring our stunning country. We feel privileged to live in such an amazing place. PS a bach is the New Zealand word for holiday house. It is pronounced batch. 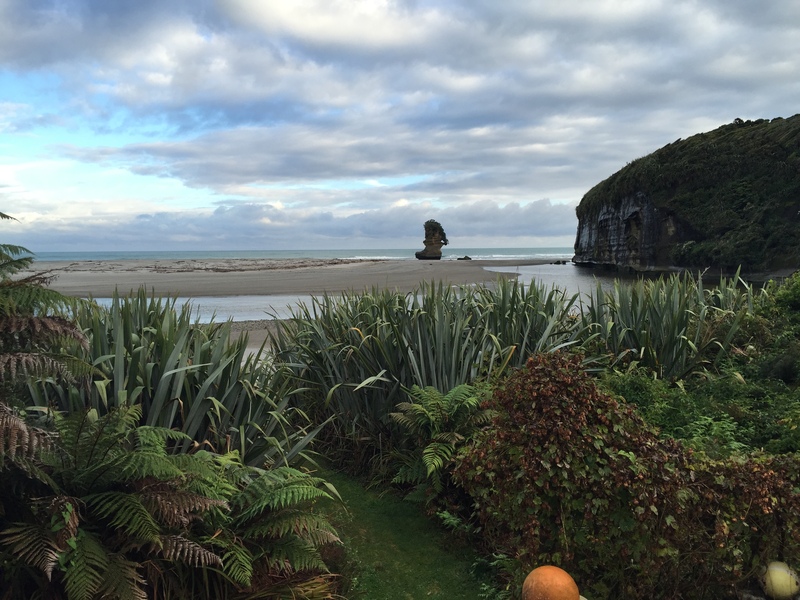 Viki, you’ve done it again…put a huge grin on my face and made me miss New Zealand! The adventures y’all get up to sound like so much fun! The kids will remember these times forever. Good on ya!! Looks fun. What a great post and set of photos! I’m hoping to do a similar trip someday. Funny how I was just thinking… “I haven’t seen a post from Viki for a while”… And there it is… Nice “non sailing” adventure. Great spot and varied photos! Well done. Yes it has been a while! I have got a new job/project on the go at the yacht club at the moment which is taking up all my blogging time! I miss it! Have got a few adventures up my sleeve to get posted soon. Hope you are well! Yes all good – very busy with work too! Still escaping on some weekends, but it’s getting colder! We have a huge adventure coming up in July with my sister and hubby coming over from France and joining us on board for 3 weeks. Wade and a couple of friends will be taking the boat up to Qld a few weeks before their arrival! Can’t wait!